Jews, Catholics and evangelical Christians are viewed warmly by the American public. 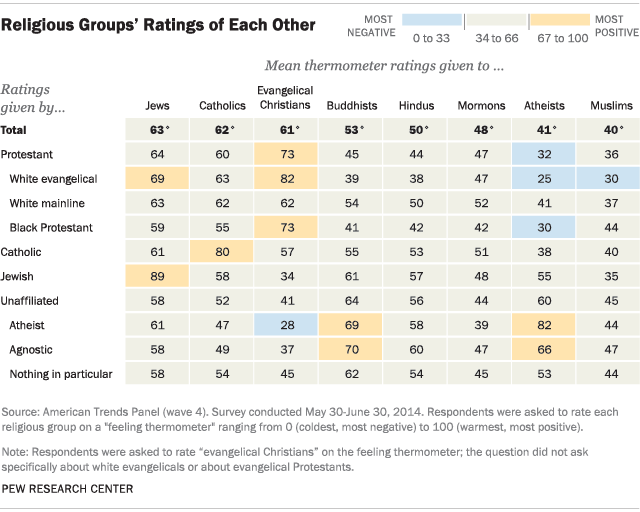 When asked to rate each group on a “feeling thermometer” ranging from 0 to 100 – where 0 reflects the coldest, most negative possible rating and 100 the warmest, most positive rating – all three groups receive an average rating of 60 or higher (63 for Jews, 62 for Catholics and 61 for evangelical Christians). And 44% of the public rates all three groups in the warmest part of the scale (67 or higher). Buddhists, Hindus and Mormons receive neutral ratings on average, ranging from 48 for Mormons to 53 for Buddhists. The public views atheists and Muslims more coldly; atheists receive an average rating of 41, and Muslims an average rating of 40. Fully 41% of the public rates Muslims in the coldest part of the thermometer (33 or below), and 40% rate atheists in the coldest part. The fact that Catholics and evangelical Christians are large groups and view their fellow adherents warmly helps explain why the two groups are among the most favorably viewed groups in the population. (Catholics account for 20% of the sample in the survey, and self-described evangelical/born-again Christians account for 32% of the sample.) The other groups included in the survey constitute much smaller shares of the overall population. As a result, their ratings are very similar whether they are based on the entire population or only on people who do not belong to the group. Attitudes among religious groups toward each other range from mutual regard to unrequited positive feelings to mutual coldness. Catholics and evangelicals, the two largest Christian groups measured here, generally view each other warmly. White evangelical Protestants give Catholics an average thermometer rating of 63; Catholics rate evangelicals at 57. Evangelicals also hold very positive views of Jews, with white evangelical Protestants giving Jews an average thermometer rating of 69. Only Jews themselves rate Jews more positively. But that warmth is not mutual: despite evangelicals’ warm feelings toward Jews, Jews tend to give evangelicals a much cooler rating (34 on average). When asked about other non-Christian groups, evangelicals tend to express more negative views. White evangelicals assign Buddhists an average rating of 39, Hindus 38, Muslims 30 and atheists 25. The chilliness between evangelicals and atheists goes both ways. Atheists give evangelical Christians a cold rating of 28 on average. Atheists give largely positive ratings to several non-Christian religious groups, including Buddhists (who receive an average rating of 69 from atheists), Jews (61) and Hindus (58). Atheists tend to give much cooler ratings to Muslims and the Christian groups asked about in the survey. Atheists themselves are rated positively by atheists and agnostics, and they receive neutral ratings from Jews and those who describe their religion as “nothing in particular.” Atheists are rated much more negatively by other religious groups. Christian groups and Jews receive higher ratings from older Americans (those ages 65 and older) than from younger Americans. By contrast, other non-Christian groups receive their highest ratings from younger Americans. Adults under the age of 30, for instance, give Muslims a neutral rating of 49, on average, whereas older adults give Muslims significantly more negative ratings (42 among those ages 30-49, 36 on average among those 50-64, and 32 among those 65 and older). These patterns may partly reflect that there are more Christians among older Americans than among younger people. In Pew Research surveys conducted this year, fully 85% of Americans ages 65 and older describe themselves as Christians, compared with just 59% among adults under 30 (32% of whom identify as religious “nones”). Jews receive their most positive ratings from whites, who give them an average rating of 66. Jews also are rated favorably by blacks and Hispanics (with each group giving Jews an average rating of 58). 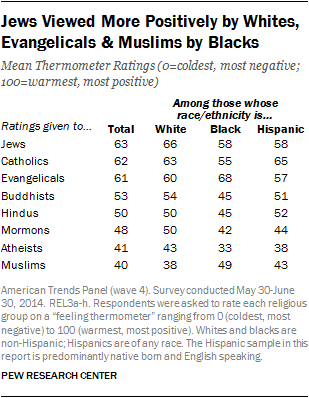 Evangelicals also are rated positively by all three groups, with their highest average rating coming from blacks (68). Muslims receive a neutral rating from blacks (49 on average), but they are rated more negatively by whites (38). Hispanics’ ratings of Muslims fall in between (43). These findings may reflect the racial and ethnic composition of religious groups. Many blacks describe themselves as born-again or evangelical Christians, for instance, and 23% of Muslims in the U.S. are black, according to the Pew Research Center’s 2011 survey of Muslim Americans. Fully 94% of U.S. Jews are white, according to the Pew Research Center’s 2013 survey of U.S. Jews. Republicans and those who lean toward the Republican Party tend to rate evangelicals very positively (71 on average). They also express warm feelings toward Jews (67 on average) and Catholics (66). The warmth Republicans feel for evangelicals may reflect the fact that many Republicans and Republican leaners are themselves evangelicals. Among those who are not evangelical Christians, evangelicals receive an average rating of 62. Mormons receive a neutral rating from Republicans and Republican leaners (52 on average), while Buddhists receive a rating of 49 and Hindus a rating of 47. Republicans and Republican leaners view atheists and Muslims much more negatively than they view other religious groups. Democrats and Democratic leaners express warm feelings toward Jews (average rating of 62) and Catholics (61). Buddhists also are rated favorably (57 on average) by Democrats. Evangelicals receive an average rating of 53 from all Democrats and Democratic leaners, but this drops to 45 among those who are not evangelicals themselves. With the exception of Jews, all of the non-Christian groups asked about receive warmer ratings from Democrats and Democratic leaners than they do from Republicans. Fully 87% of U.S. adults (including 85% of non-Catholics) say they personally know someone who is Catholic. And seven-in-ten people (including 63% of non-evangelicals) say they know someone who is an evangelical Christian. Because Catholics and evangelical Christians are such large groups, it is to be expected that most people would know someone from these groups. Most Americans also say they know someone who is Jewish (61%) or an atheist (59%), even though these groups are much smaller than Catholics and evangelical Christians; roughly 2% of U.S. adults identify religiously as Jewish, and a little more than 2% identify as atheists. Other small groups are less familiar to most Americans. For example, 44% of Americans say they know someone who is Mormon, and 38% say they know someone who is Muslim. Mormons constitute about 2% of the U.S. adult population, and Muslims roughly 1%. Roughly one-in-four adults or fewer say they know a Buddhist (23%) or Hindu (22%); these groups each account for roughly 1% or less of the overall population. Knowing someone from a religious group is linked with having relatively more positive views of that group. Those who say they know someone who is Jewish, for example, give Jews an average thermometer rating of 69, compared with a rating of 55 among those who say they do not know anyone who is Jewish. Atheists receive a neutral rating of 50, on average, from people who say they personally know an atheist, but they receive a cold rating of 29 from those who do not know an atheist. Similarly, Muslims get a neutral rating (49 on average) from those who know a Muslim, and a cooler rating (35) from those who do not know a Muslim. The American Trends Panel (ATP), created by the Pew Research Center, is a nationally representative panel of randomly selected U.S. adults living in households. Respondents who self- identify as internet users (representing 89% of U.S. adults) participate in the panel via monthly self-administered Web surveys, and those who do not use the internet participate via telephone or mail. The panel is being managed by Abt SRBI. Data in this report are drawn from the June wave of the panel, conducted May 30-June 30, 2014 among 3,217 respondents (2,849 by web and 368 by mail). The margin of sampling error for the full sample of 3,217 respondents is plus or minus 2.2 percentage points. The ATP data were weighted in a multi-step process that begins with a base weight incorporating the respondents’ original survey selection probability and the fact that some panelists were subsampled for invitation to the panel. Next, an adjustment was made for the fact that the propensity to join the panel varied across different groups in the sample. The final step in the weighting uses an iterative technique that matches gender, age, education, race, Hispanic origin and region to parameters from the U.S. Census Bureau’s 2012 American Community Survey. Population density is weighted to match the 2010 U.S. Decennial Census. Telephone service is weighted to estimates of telephone coverage for 2014 that were projected from the January-June 2013 National Health Interview Survey. It also adjusts for party affiliation using an average of the three most recent Pew Research Center general public telephone surveys, and for internet use using as a parameter a measure from the 2014 Survey of Political Polarization. Sampling errors and statistical tests of significance take into account the effect of weighting. The Hispanic sample in the American Trends Panel is predominantly native born and English speaking. The adjoining table shows the unweighted sample sizes and the error attributable to sampling that would be expected at the 95% level of confidence for different groups in the survey. The Web component of the June wave had a response rate of 60% (2,849 responses among 4,729 Web-based individuals enrolled in the panel); the mail component had a response rate of 66% (368 responses among 556 non- Web individuals enrolled in the panel). Taking account of the response rate for the 2014 Survey of Political Polarization (10.6%), the cumulative response rate for the June ATP wave is 3.5%.